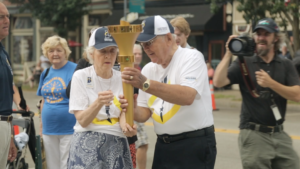 Organizing over 2,000 torchbearers, in 92 counties, over a course that spans over 3,000 miles is a monumental job, one that took many community volunteers. Each county in Indiana has at least one community coordinator to help organize its celebration. These people are volunteers tasked with deciding where the torch will visit while it is in each county. The state police gave each community coordinator an entry point, where the torch would move into their county, and an exit point, where it would leave and enter a new county. From there, they were free to decide which county landmarks they wanted the torch visit, and where each torchbearer would take the torch. Nancy Carlson, the county coordinator for Delaware County, said she was asked to head the project by Kelli Huth, who was the president of the Delaware County Historical Society. Carlson, a retired professor of telecommunications at Ball State University with a love for the history of Indiana, agreed and began planning the celebration for Delaware County. She was given the entry point and decided to start the relay with Mayor Dennis Tyler at the Delaware County Fairgrounds. The exit point is just past Selma, and a string of 12 torchbearers will take the torch along State Road 32 before Jack Williamson hands it over to Randolph county. Carlson said this project is important because it gives people a sense of pride in Indiana. Though she is a native of Illinois, Carlson has lived in Indiana for 36 years. “I know a whole lot more Indiana history than Illinois history,” she said. The older she gets, the more she is interested in history, she said. 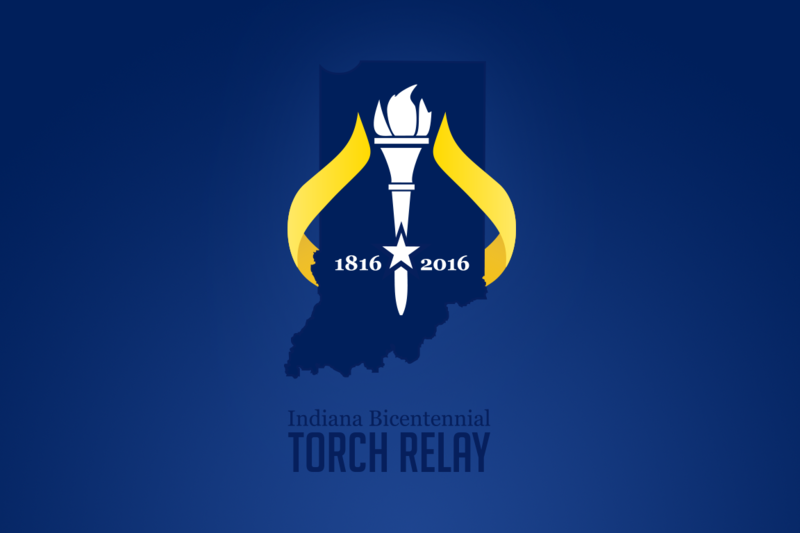 The Bicentennial Torch Relay is about the people of Indiana, through and through. Residents of Indiana were the ones who nominated people to be torchbearers. For a 7-month period in 2015, nominations for torchbearers were open to the public. Sue Scholer, the county coordinator for Tippecanoe County, said she was concerned at first because the nominations were being done online. A lot of people, she added, don’t have internet access, or might not know that the nominations were available. She was relieved, she said, when a PSA went out to all the people, and she said she thinks it increased the nominations. “Anyone could nominate anyone,” Carlson said. Because of how the nomination was set up, she said she received no pushback from people about who was chosen as a torchbearer. Of the 60 people nominated, a committee chose the 24 people who would bear the torch in Delaware County. “Every county picked good people,” Carlson said. “It warms my heart that 2,000 good people will carry a torch.” Further, she said, there are no politics involved in the relay. It is simply a celebration of where Indiana has been and where is going. Tippecanoe County had a total of 115 nominations for torchbearers. Early on, she said, it was decided that there would be no elected officials who would carry the torch. Instead she wanted the 55 torchbearers to simply be people from the county, to celebrate the county in that way. The torch’s original route through Tippecanoe County did not go through many of the places Scholer wanted to hit, she said. There was also roadwork going on in part of that route. “It was a good excuse to change it,” Scholer said. The route now goes through Columbia Park, Purdue and an art museum, among other sites. Athletes from Purdue will run the torch around the stadium. The torch will also go out to John Purdue’s grave, carried by Purdue’s current president, Mitch Daniels. Also in Tippecanoe County, the torch will cross the Wabash River on a canoe, Scholer said. Scholer said she wanted the torch to go past Fort Ouiatenon, but there was not enough time on the schedule. Instead, members of the Fort Ouiatenon Brigade will carry the torch by canoe across the river. In the final leg of its journey through the county, the torch will be taken to Warren County in a fire truck, carried by Indiana Teacher of the Year Kathy Nimmer. In Delaware County, modes of transportation other than on foot include three convertibles and a horse-drawn milk wagon, Carlson said. The milk wagon is from Riggin Dairy, and Eli Riggin will run beside it with the torch. After all the torchbearers have been decided upon and the route finalized, the job is still not over for the county coordinators. They still run practices with the torchbearers and help to plan the events to celebrate the torch and the bicentennial. “I didn’t anticipate quite as much involvement on an ongoing basis, but it’s been fun,” Scholer said.